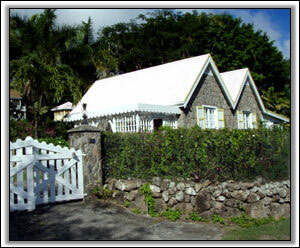 Located on the southern slope of Nevis Peak, next to the Montpelier Plantation Inn, this property features a main house with adjacent patio and pool; a stone cottage out of sight of the main house and with a separate gate entrance; a glassed in gazebo currently serving as a studio; and one and a half acres of terraced land with mature tropical plantings. 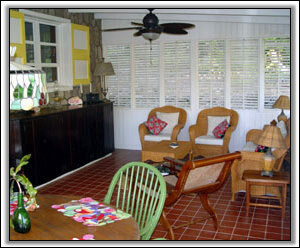 All buildings reflect traditional Nevis plantation style and provide two very private separate living spaces. 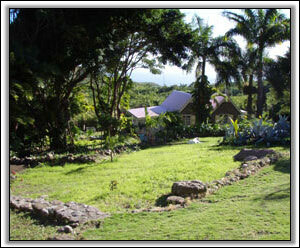 The location affords a lovely view of the gardens, the mountainside, and the ocean at a distance. Cool trade winds provide comfortable temperatures both summer and winter. Beaches are ten to fifteen minutes away by car. This picturesque stone cottage was built in 1985. It has two bedrooms (each 12'x12') and one bath located between the two bedrooms. The bath has a laundry closet with a small washer/dryer. The bedroom facing west is air conditioned since it is somewhat cut off from the east/west trade winds. 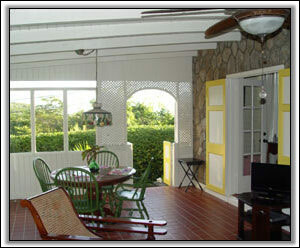 It has a separate porch with potted plants and a fragrant flowering stephanotis vine. The other bedroom is adjacent to the kitchen and the living/dining area. 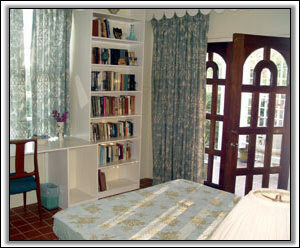 Both bedrooms have separate access from the outside. The cottage has been featured twice in a travel magazine. 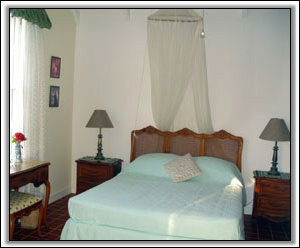 For many years it has been rented very successfully as a moderately priced, romantic hideaway. Furnishings are cozy and "cottagey." The kitchen is well equipped . The living/dining area opens out to a secluded lawn with comfortable garden furniture. Rates may be reduced for longer stays.